One of the coolest features offered by Apple is its ability to sync data across multiple devices. They call their service as iCloud. Wouldn’t it be great if we had a similar service for Android devices too? Well now you have. 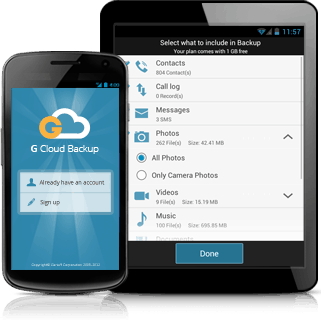 Say hello to G Cloud, your ultimate cloud backup solution for Android devices! G Cloud is a free app available on Google Play Store that intelligently backs up your data in a secure cloud location, so you never have to worry about losing your data anymore. Just tell the app what to back up and G Cloud will take care of the rest. It offers you an initial space of 1 GB, though you can get up to 8 GB by completing some of the free offers. However, G Cloud does not sync your data across multiple Android devices; it only provides a Backup and Restore solution for all your device data (Contacts, Call logs, Messages, Documents, Media, Photos, Settings and your Browser Data). On the other hand, the G Cloud account you create is a global one that you can use across all your devices. So you can back up data from one device and restore the same data in other devices. The only thing is, you have to do the backup and restore operations manually. G Cloud does its work quite intelligently, using as little of your device resources as possible. For example, by default, G Cloud only backs up your data over a Wi-Fi connection to prevent unnecessary charges to your data plan (3G/4G). You may, however, also change the settings so that data backup occurs over 3G/4G networks too. Similarly, G Cloud monitors your battery health and only backs up data when your device is plugged-in (charging) or your battery has enough power. It will automatically stop backup operation if the battery level falls below a specific (user-defined) percentage and resume again when the battery is sufficiently charged up. Download the app from Google Play and install it on your Android device. Create a free account by signing up for G Cloud. You get an initial free cloud storage of 1 GB. Select what to back up from your device. The app automatically backs up data intelligently over Wi-Fi. If new files are added, they will be automatically backed up. If you change, reset or upgrade your device, just install G Cloud on it and sign in to your existing account. The setup wizard will guide you through the restore process. You can choose to restore all your files or just specific ones. You get an additional free space of up to 7 GB by completing some simple tasks. – Securely transfers your files to the cloud (using AES 256 encryption). – Uses Amazon S3 cloud storage for its backup and restore services. – Scheduled daily backup over Wi-Fi when there is enough battery power left. – Backup support for external SD Cards also. – Easily restore your files and settings from one device to another or the same device (after upgrade or reset). – Back up multiple versions of files. – Settings to backup files over 3G/4G and disable automatic backups.